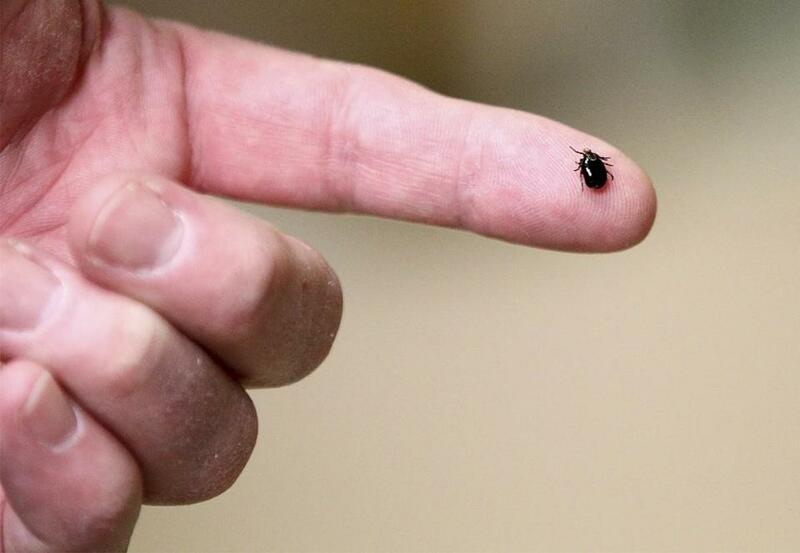 Veterinarian Bruce Hill displayed a tick he found on a dog at the DeWitt Animal Hospital in Plainville. From May through July — as both tick activity and the amount of time people and pets spend outdoors tend to peak — people get more tick bites and tick-borne diseases than any other time of year, according to the US Centers for Disease Control and Prevention. There’s no sure way to predict how bad a particular tick season will be, but the arachnids are expected to infect thousands of people across New England — a hot spot for tick-borne illnesses. Here’s an overview about these tiny pests and the illnesses they can spread. The most well-known problem ticks carry is Lyme disease, but there are others to worry about. In recent years, Massachusetts has seen a surge in reports of two other tick-borne illnesses besides Lyme disease. The two illnesses — anaplasmosis and babesiosis — cause flu-like symptoms that can turn severe and, in rare cases, even fatal, particularly for the elderly or people with weakened immune systems. Treatment is available for both illnesses. Last year, 842 confirmed and probable cases of anaplasmosis were reported to the state’s public health department, along with 518 confirmed and probable cases of babesiosis. Just a decade ago, those figures were 67 and 43, respectively. 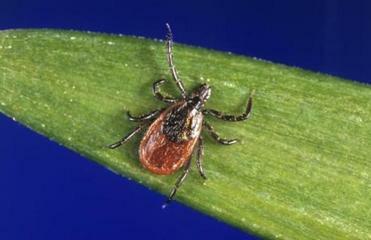 There is also one other very rare, but severe, tick-borne illness is called Powassan virus. Powassan symptoms include headaches, vomiting, confusion, seizures, memory loss, and long-term neurological problems, and it can cause death. There is no treatment. The first reported Powassan case in Massachusetts was in 2013, and there were a total of 13 confirmed and probable Powassan cases statewide between 2013 and 2016. Even as other illnesses have been reported in growing numbers, Lyme disease has remained by far the most commonly reported tick-borne illness in the state. Lyme disease often causes flu-like symptoms and a rash that can take a bull’s-eye shape. If untreated, it can cause long-term problems, including cognitive issues and arthritis. The disease rarely causes death. Reported cases of Lyme disease have generally risen since the early 1990s. Increases in reported numbers, both in Massachusetts and elsewhere in the country, have been attributed to factors including residential development expanding into wooded areas and better awareness and reporting of the disease. But in each of the past three years, the number of confirmed and probable cases in Massachusetts reported to the state’s pubic health department has dropped. Officials from the state public health department said the decline in reports is likely due to year-to-year fluctuations in weather patterns and tick populations. But such official counts are believed to give only a glimpse of the true toll of Lyme disease. Officials believe that many Lyme disease cases go unreported. In 2013, the US Centers for Disease Control and Prevention released preliminary results from research that estimated the number of Americans diagnosed with Lyme disease each year to be around 300,000, or about 10 times more than previous nationwide tallies that were based on numbers reported to public health officials. Though officially reported figures represent only a fraction of all infections, the data can be used to monitor how the prevalence of the disease has changed over time. Reports of Lyme disease have historically been concentrated in the Northeast and the upper Midwest. 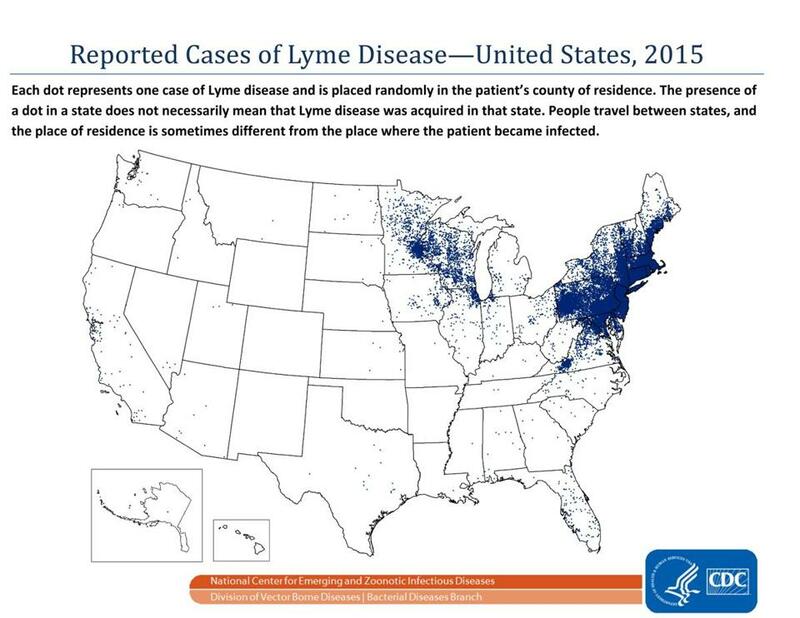 In 2015, 95 percent of confirmed Lyme disease cases were reported from 14 states: Connecticut, Delaware, Maine, Maryland, Massachusetts, Minnesota, New Hampshire, New Jersey, New York, Pennsylvania, Rhode Island, Vermont, Virginia, and Wisconsin. This chart shows Lyme disease rates by state. Figures are three year averages based on confirmed cases reported per 100,000 residents from 2013 through 2015. A town-by-town look at reported confirmed & probable cases per 100,000 residents between 2010 and 2014. Within Massachusetts, rates of reported infection vary significantly from one area to another. Between 2010 and 2014, the municipality with the highest proportion of reported confirmed and probable cases was the small Martha’s Vineyard town of Chilmark, with 1,316 cases per 100,000 residents, according to data from the state health department. The island of Nantucket had the next highest rate at 598 cases per 100,000 residents. Other areas of the Cape and the islands also had high rates of Lyme disease during those years. The Cape and the islands were the first places where Lyme emerged in Massachusetts, and experienced increasing rates of the diseases from the 1980s until recent years when the infection rates in that area have appeared to stabilize, officials have said. Tick-borne illnesses in Massachusetts come from two species of the arachnid: dog ticks, which can carry some illnesses but are not known to carry Lyme disease; and deer ticks, also called black-legged ticks, which are known to carry Lyme disease. • Check themselves and pets for ticks after being outdoors.